Our Free May 2018 Birmingham Calendar Is Here! | Infomedia, Inc.
Our Free May 2018 Birmingham Calendar Is Here! May is when summer weather begins in Alabama and activities seem to appear on nearly every weekend. From Mother’s Day to Memorial Day, along with events like the Southern Beer Fest and Star Wars Team Trivia, this month is chock full of fun times in Birmingham. If you’re a local business, be sure to use our calendar as inspiration for your own social media postings. Does your teen have a passion for tech? Make sure they attend the Birmingham Public Library’s Teens Engineer BHM event. Run by the UAB Engineering Student Mentors, the free class will cover everything from coding to soldering your own electrical components. Sip on mint juleps for a good cause by attending the Birmingham Derby Party. Presented by Shelby Humane, this first-time event will raise funds for the non-profit that supports animal care, pet adoptions and more. The party will include drinks, food, live music and horses provided by Windwood Equestrian. Enjoy the best Turkish delicacies at the fifth annual Turkish Food Festival. Held at Veterans Park, the outdoor event will feature various dishes, Turkish tea and coffee, traditional folk dancing and hourly raffles. Proudly let your geek flag fly at the Homewood Public Library’s Star Wars Team Trivia. Up to seven people can compete on a team for bragging rights of knowledge about a galaxy far far away. Prizes will be awarded to the trivia winners along with awards for the best team name and best costume design. The event is free, but be sure to register ahead of time. Celebrate the holiday at Birmingham’s only public garden, the Birmingham Botanical Gardens. Always free, the Gardens are the perfect place to soak up a little sunshine and relax leading into the weekend. Get a taste of down home brewing at the Great Southern Beer Fest. The festival will be held at Railroad Park and features craft beers from across the south. Along with beverages there will be southern cuisine, live music, games and more. For those interested in a dry good time, there are also heavily discounted designated driver tickets available. Show your mama some love this Mother’s Day. Plenty of restaurants around Birmingham have brunch specials and some businesses, such as spas, feature Mother’s Day discounts. Give your teen a head start when it comes to software by enrolling them in the Homewood Public Library’s Teen Coders class. The free class is for 6th-12th graders with an interest in coding and bringing your own laptop is suggested. Support the Sidewalk Film Festival (and eat delicious dips) by attending the 8th Annual Salsa Showdown. This fundraiser features tastings of salsa, queso and guacamole, along with live music, a hot pepper eating contest and kid activities. Observe Memorial Day with one of the many events happening throughout central Alabama, like the Southeastern Trail Runs weekend race or the Cheaha State Park naturalist activities. Never want to miss an event in Birmingham? 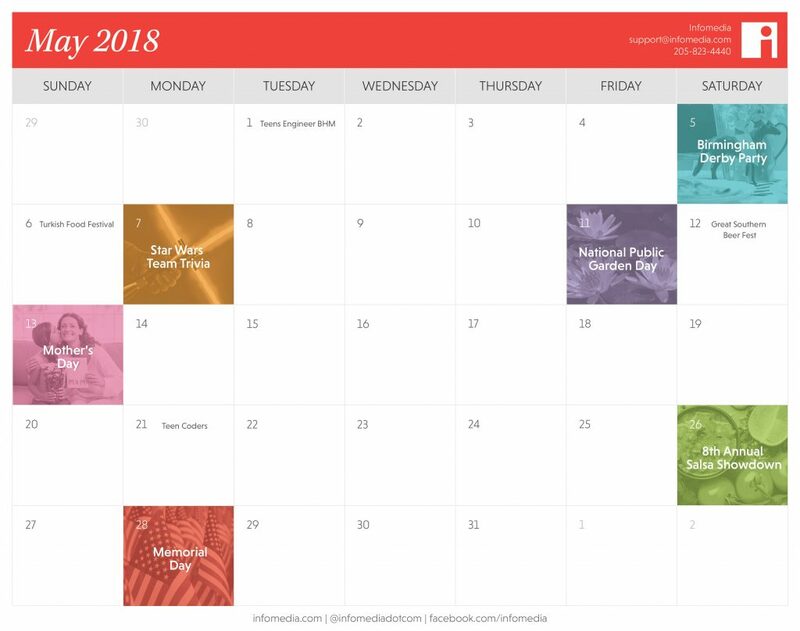 Download our May 2018 free calendar to keep up-to-date on happenings.